Do LCD displays wear out or fade with age? 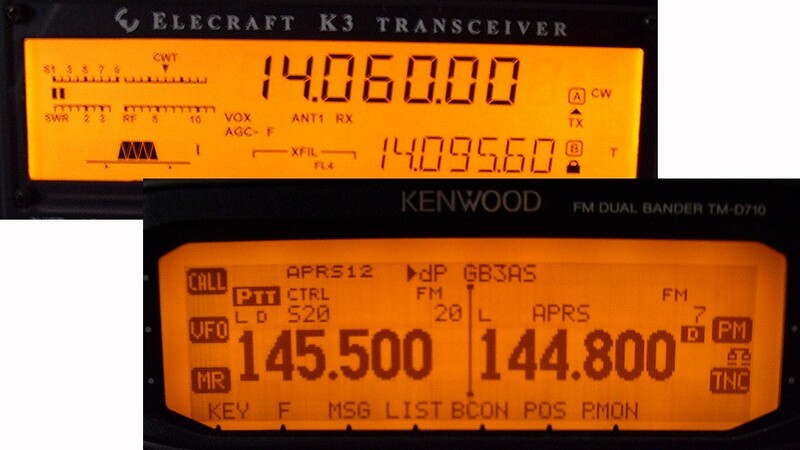 The picture above shows the displays of my Elecraft K3 transceiver and my Kenwood TM-D710 VHF rig. The Elecraft display is sharp with good contrast and characters look almost black against the orange background. The Kenwood display is much less contrasty. The backlight is not as bright as the K3's but the characters look more murky brown than black no matter how I set the brightness and contrast. It's quite noticeable when the two radios are side by side. My D710 has been running 24/7 for more than a year (with a brief hiatus when I went into hospital until I felt like running the APRS gateway again.) Could the display have faded (for want of a better way to describe it) over time? Or is my recollection that the text used to look more black than brown faulty? Back in February I bought a Baofeng UV-3R+. It came after an unusually long wait for products from China, in March. 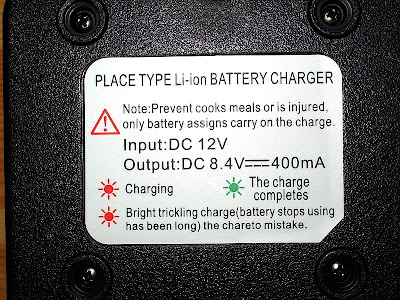 In that time, eBay vendors had begun advertising the new Baofeng UV-5R which had double the output power and a key-pad that could be used for DTMF. To add insult to injury the price of the 5R was less than I paid for the 3R+. As the months passed the knowledge that the UV-5R could still be bought for an absurdly low price niggled away at me, until eventually I gave in and ordered one. Unlike its little brother the 5R got here in little more than a week. So now I have two Baofeng HTs. A ham can never have too many radios, especially at this price! After I sold my original UV-3R to make way for the Plus I had a few regrets. The original had the advantage of being lightweight and tiny. Although the Plus was only a few millimetres larger and a few grams heavier the difference felt more marked. It lacked the cuteness of the earlier model. But the drop-in desk charger was a nice standard accessory. 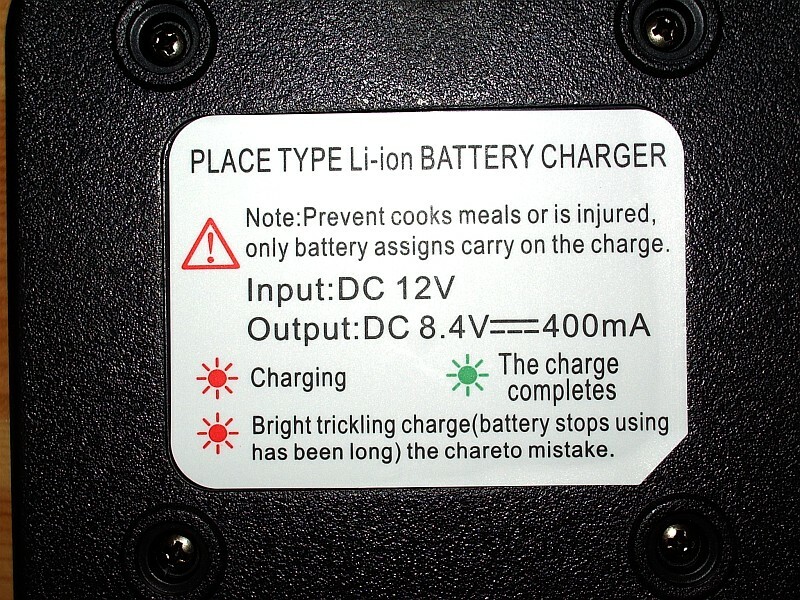 The accessory port was the same as used by Kenwood and Wouxun, enabling some standardization. It is a nice little radio but functionally almost identical to the original 3R. 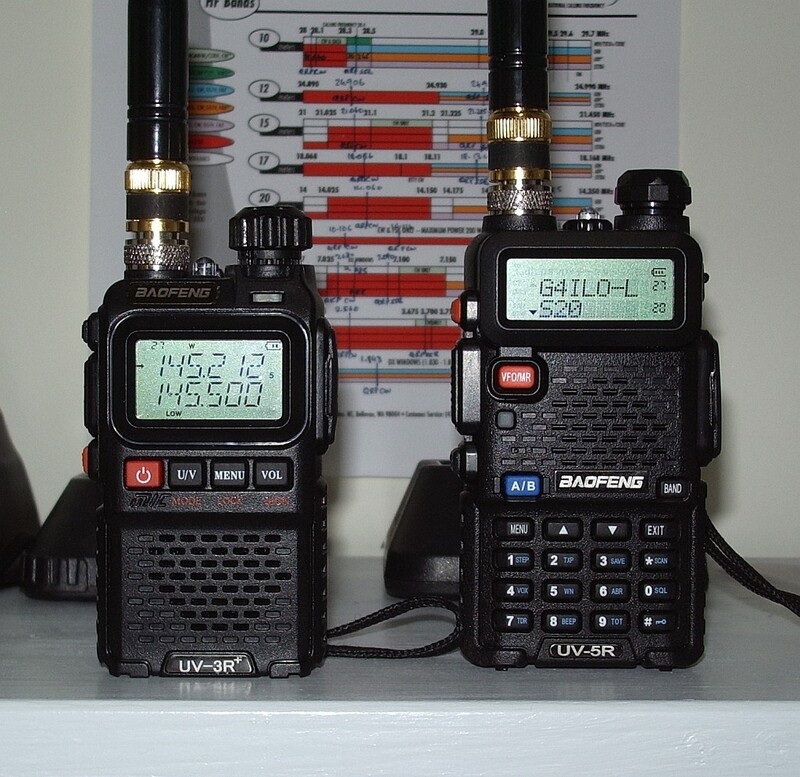 The UV-5R is quite a big improvement over its little brother. It isn't a lot bigger or heavier than the 3R+ but the extra size and weight gains you double the output power (4W compared with 2W) and a keypad which supports both frequency entry and DTMF. The latter makes the radio much more useful on Echolink. The 5R feels solid and well built like the 3R+. In fact it feels like a radio that cost three times the price. I think Baofeng has hurt sales of the basic handhelds made by the Japanese "big 3." Only rigs with ham radio specific extras like supporting D-Star or APRS will be able to justify a higher price. As neither of those things are useful for the typical Chinese business buyer of these radios I can't see Baofeng starting to compete in that area. So Yaesu, Icom and Kenwood can breathe a sigh of relief. Analogue volume control with proper on-off switch . I like the way the display (and keypad) lights up when a signal breaks the squelch and stays lit for a few seconds after the signal has finished. If you have more than one handie in use this feature lets you know which radio received the call. My Wouxun also does that. There are a lot of other things to like, such as the voice announcement (my ham rigs don't have that) and the fact that accessories and spare parts being really cheap. The same computer interface cable works with both Baofengs and the Wouxun. Headsets and speaker-mics work with two Kenwood radios as well. Judging by the comments of some buyers in the user groups, "Baofeng quality" is still an oxymoron. You are taking a chance that the radio you receive will not have any faults. 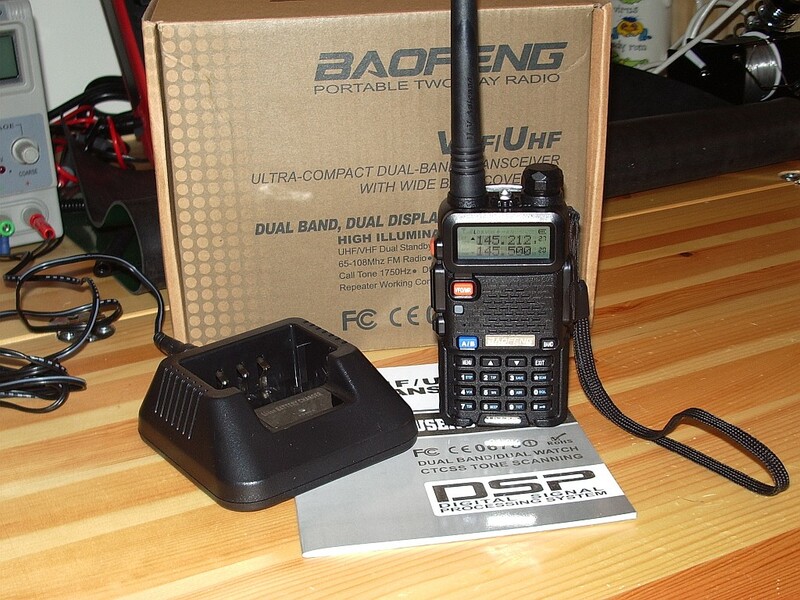 Sending the set back to Hong Kong But if you are prepared to take that risk (or pay a bit more and buy from a local dealer) then the Baofeng UV-5R is worth a lot more than you pay for it. I'm not seeing anything else, though F6HTL spotted my transmission 2 minutes later. I wonder what type of propagation that was? I am sorry to learn via the blog of PC4T that Chuck W5PG passed away on 18 July. Chuck was one of our little community of ham radio bloggers. Losing one of our number is like losing a friend. In his last blog entry he wrote about his efforts to get fit enough to do a bicycle hike later this year. His passing is, to say the least, unexpected. My thoughts are with Chuck's family and friends. Hans Summers (G0UPL) and Steve Farthing (G0XAR) have recently begun selling a new kit for a QRPp (150mW) beacon that can generate Hellschreiber, various QRSS modes and best of all WSPR. Unlike the ones now sitting unused in a drawer in G4ILO's shack which have my details programmed in, the Ultimate QRSS Transmitter Kit has a user interface with an LCD panel that allows you to input your own callsign, locator and power output. This means it has resale value - when you get bored you can sell it on and the new owner can program it with his own details. At the moment, kits are only available for the 30m, 40m and 80m bands, though they can also generate an audio signal that can be used to drive an SSB transmitter. 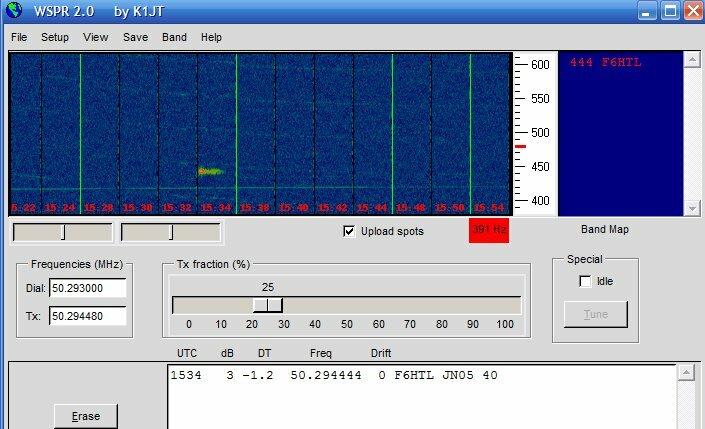 I asked Hans if they were going to offer a version for 20m, which has become one of the most popular WSPR bands. His reply was that the kits will actually work fine on any frequency between 1MHz and 20MHz, they just require a different crystal and different components in the low pass filter. A 20m beacon for WSPR would need a 14.097MHz crystal. I searched my junkbox and couldn't find one. Nor could I find a source for one and having one specially made would be expensive. Perhaps if there is enough demand for a 20m version it will be worth Hans and Steve's while to have a batch made which will be cheaper. I'm on 6m with my Elecraft K3 and I've noticed that VFO B is following VFO A. Whatever frequency I dial using VFO A and the main tuning knob, VFO B changes with it. On other bands the VFOs are not linked like this but turning the VFO B knob does nothing. Obviously I accidentally pressed something I shouldn't have, so I don't know what to do to undo the action. 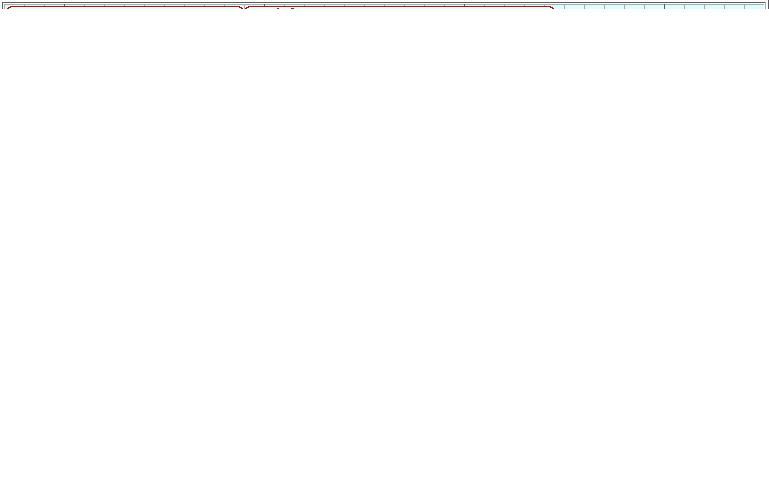 Does anyone know what I should do to get VFO B working normally again? Switching off and switching on again didn't solve the problem. UPDATE: VFO B was not changing because LOCK was on. Having turned LOCK off I can change VFO B independently using the knob. VFO B and VFO A now show different frequencies, but if I turn the VFO A knob, VFO B now changes by the same amount! 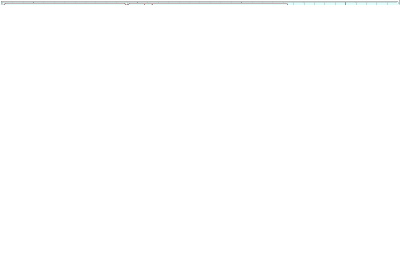 I don't seem to have SPLIT on, in fact when I press SPLIT the message SPL N/A is shown. 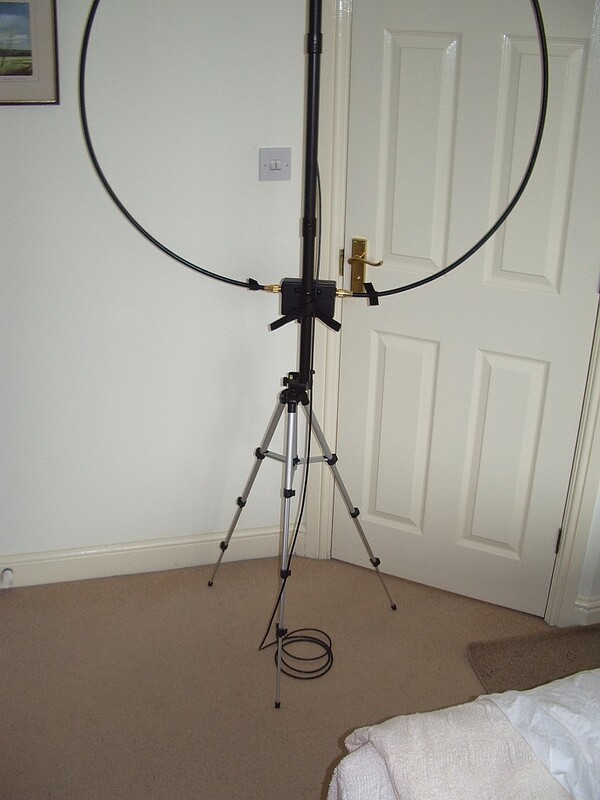 Having got an AlexLoop WalkHam antenna I needed some way of holding it up whilst it was in use. 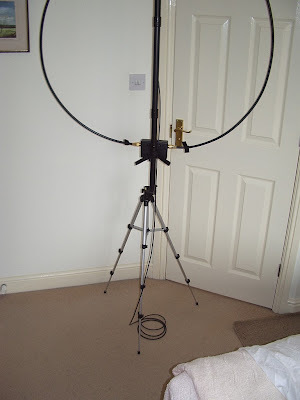 After considering ideas like a guyed mast made from plastic pipe I decided the best solution would be a photographic tripod, if only I could devise a way of mounting the antenna on it. 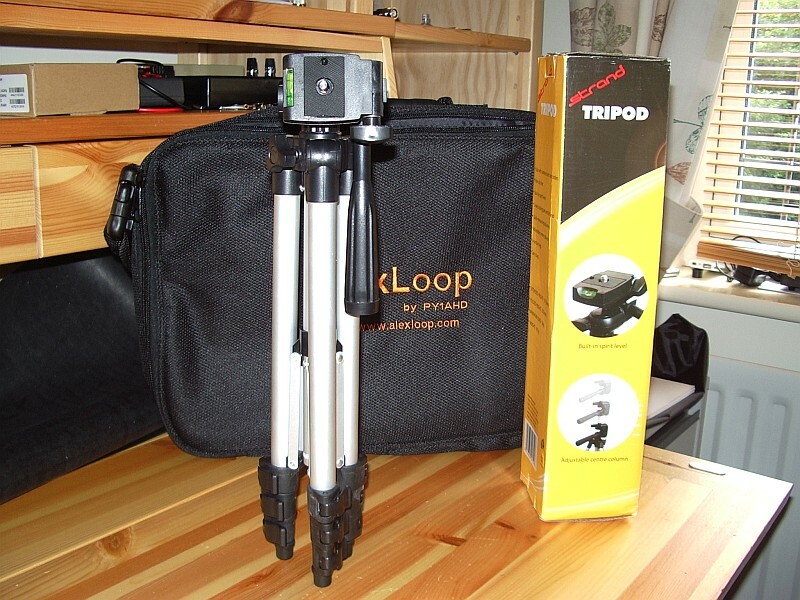 After scouring eBay for a suitable tripod I came across this one from British firm Strand Europe. Unfortunately this won't be much help if you're not in Britain as the seller will only post to the United Kingdom. The tripod is short enough when collapsed to fit inside the WalkHam carrying case - the stumbling block for most of the ones I looked at which were just a bit too long. What's more, the panning handle can be secured in the vertical position and fits inside the WalkHam's mounting pole like it was made for it! So no modifications are needed and you can still use the tripod for photography if you want. "The perfect tripod is the VIVITAR VIV-VPT-1250. It is a 50'' unit and the lightest and most inexpensive VIVITAR unit that can be found for less than U$ 10.00. The secret is take off the camera head with a Phillips screwdriver and leave the aluminum tube on the top. It must be marked with a pencil at 4 inches (12 cms): that is the maximum extension that can be used to introduce something to avoid any pressure on the antenna elements. 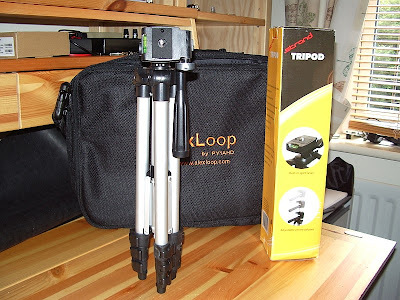 Without the camera head the tripod can be collapsed and carried inside the antenna bag." I couldn't find the Vivitar for as little as $10 in the UK so I'm content with my purchase. My only reservation is that the tripod is much lighter than the antenna (a good point for the person carrying it of course) and might be inclined to blow over if used in much of a breeze. I'll find out when I manage to try it! I can't say whether Alex's recommended model would be any better in that respect. Going on right now, on 2m. Why don't we get such openings here?